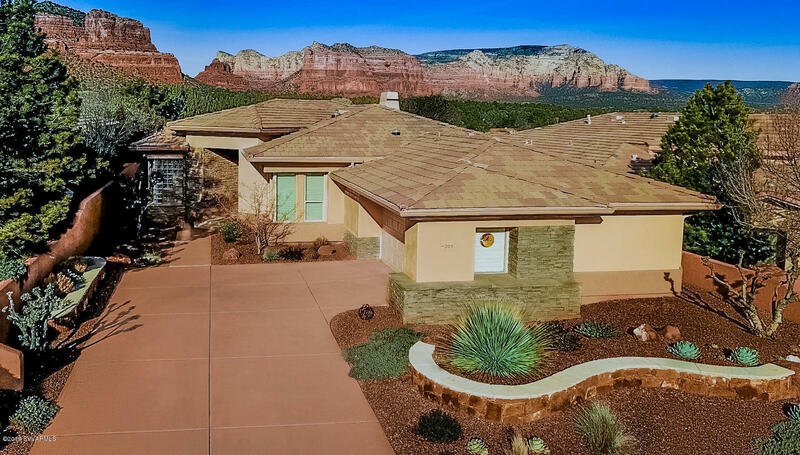 Sensational, unobstructed VIEWS from the back overlooking the 13th hole on the Sedona Golf Resort course. This beautiful 2 bdr, 2 ba w/ den was totally remodeled including kitchen cabinets, appliances & Travertine floors which extend to outside patio. Baths fully renovated including granite counters, frameless glass shower enclosures, Alder cabinets. All windows were replaced with high efficiency windows + plantation shutters & Hunter-Douglas blinds in living rm & Graber in dining rm & den. HVAC & water heater replaced in 2013 . Fireplace remodeled adding hearth, granite surround & mantle. Step out to the Travertine covered patio overlooking the golf course & soak in those phenomenal views framing Bell Rock & Courthouse Butte. Excluded items outdoor BBQ, TV/ wall mount in garage.